Whether you believe in astrology or not, you’ve probably heard all about what your astrological sign reveals about you. From auspicious dating advice to personalized makeup suggestions, the stars seem to have a lot to say about us, and most of it ranges from fun and benign to thought-provoking and introspective. Most astrology followers opt to pick out the good qualities listed for their sign and pretend that nothing scary, weird, or gross exists in their charts. 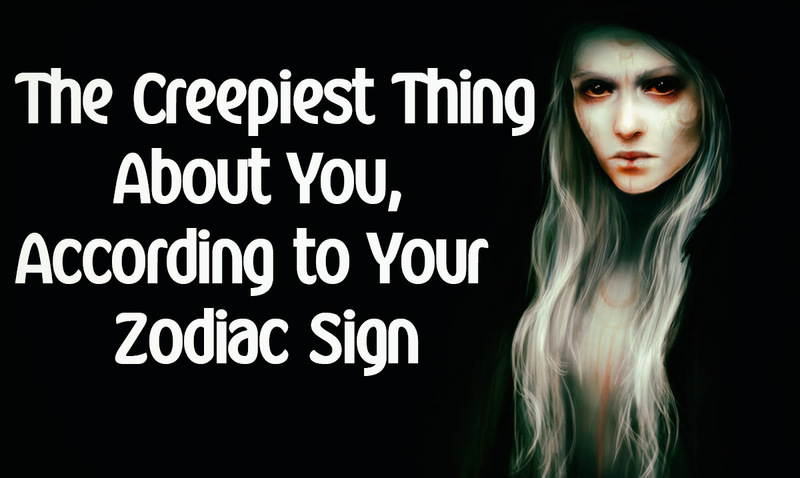 The bad news is there are creepy zodiac sign traits, and no one is safe – especially you, Scorpio. Each sun sign has its own set of negative qualities and if you are well-versed in all that is the stars, you probably already have an inkling of an idea of what the creepiest thing about you according to your zodiac is. There’s no getting around this, Aries: you desperately need to attend anger management. You’re just as headstrong and opinionated as your fellow fire signs Leo and Sagittarius, but unlike them, your energy and enthusiasm can turn into explosive violence at the drop of a hat. You’re a walking time bomb of seething rage, and the more you try to hide it, the more it escapes in unpredictable, volatile mood swings. Do yourself a favor and invest in a stress ball or a gym membership before you do something you’ll really regret.